Welcome to our itineraries page! Tanzania is a large country, and is actually one of the most complicated in terms of working out which parks to combine (true for Northern Tanzania mainly). It can therefore be a good idea to browse through these options as some inspiration for your trip. Something may catch your eye about the Ngorongoro region which makes it a must-see for you, or you may fall head over heels with a lodge in the wild west of the country. We can craft any itineraries to suit you entirely, providing that it is all logistically possible with your time frame and budget.So please note this page is merely here to give you an idea of some of our favourite combinations. We hope this serves as a useful tool for not just inspiration, but so you can work out the kind of trip you can get for your budget and time frame. Northern - Northern Tanzania including Ngorongoro and The Serengeti. Honeymoon - These are a selection of the most romantic spots on the continent. Family - When taking the family, you need to be sure all ages are entertained and the lodges don't break the bank when paying for little ones, so here are our favourite picks throughout the country. Expert - If you are after the very best the country has to offer, this is for you. Private pools, butlers and even private safari parks... This is the creme de la creme of Tanzania holidays. Simple and rustic safari, no electricity for added atmosphere! Larger hotel on Zanzibar that has great facilities and excellent for families. 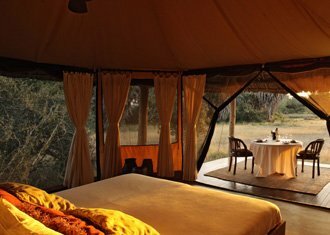 An intimate and brilliant value luxury tented camp in a good location within the Selous. Game viewing activities include open-sided 4x4 game drives, walking safaris and boating safaris. Breezes is exceptional value for money. It may be a large hotel but it delivers a trusty and excellent product. It is our favourite in the ‘large hotel’ category and perfect for families and honeymooners alike. Having been running for longer than most of the other properties on the island you can expect the years of experience to shine through. The facilities are great and the lovely long pristine beach makes its size all worthwhile. Authentic safari lodges, Mwagusi being the oldest and most famous in the park. Client favourite on the beach to end. Impala Selous is placed right on the banks of the Rufiji River, in an incredible position for spotting the local inhabitants. It’s not nearly as expensive as its extremely luxurious competitors but very close in terms of service. The raised tents offer every comfort, with two of them being adjoining ‘family’ tents. A very friendly camp, great for children and offering the best of the Selous. A fantastic camp situated in the remote wilderness of the Ruaha National Park. 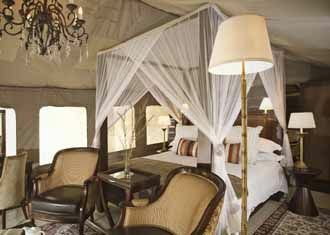 It has a formidable reputation as a true safari camp that offers its guests a very authentic experience. 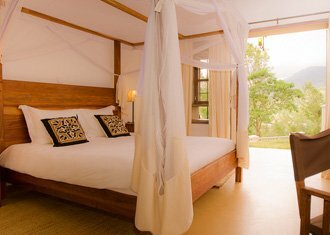 It offers a ‘rustic luxury’ that gives you everything you need in a true Tanzanian style. Run by the inimitable Chris Fox, who has spent his entire life in the park; it’s real safari, in a great park with awesome guides. It helps that the food and service are also brilliant. Some of the best value camps we do, still all in the exact right place for the best game, but no whicstles and bells with this one. Machweo Retreat is the newest addition to Onsea House, its sister property. Onsea House is one of Arusha’s best little properties and Machweo retreat is right next door, replicating the same level of quality in service and rooms. The food here is exquisite and some of the best in east Africa. 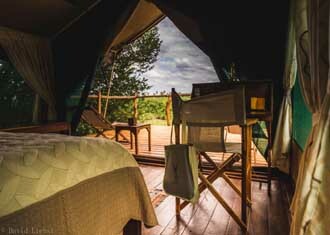 The Serengeti offering from the Kirurumu brand, Kirurumu Serengeti Camp is a great value mobile tented camp. The camp moves between Seronera and Ndutu while a second camp runs from June through to October in Kogatende. It's a very good camp in its own right but if you're looking to see Mara River crossings without blowing the budget this camp stands out head and shoulders above the rest. Slight upgrade to Manze but still a great rustic safari with a larger hotel on Zanzibar that has great facilities and excellent for families. Siwandu reigns supreme in our opinion. It has a fantastic location, great guides and gorgeous tents offering every luxury in a truly authentic style. Discreetly tucked amongst the palm trees on the banks of Lake Nzerakera, it has everything you could want in a safari holiday and is definitely our number one tented camp in the Selous. Jongomero is an absolutely exceptional safari camp. It is one of our favourites in the whole of Tanzania, which is not a compliment we hand out easily. It is the most luxurious camp in the park as well as offering fantastic service, the most remote location and guiding so good it borders on genius. Jongomero really is a firm favourite and one we highly recommend. Baraza is one of the most luxurious hotels on Zanzibar. It transcends traditional expectations of a beach hotel and provides a phenomenal service that offers its guests every creature comfort and more! It boasts one of the finest beaches on the island and combines this with some incredible facilities. You are in very safe hands with this top end beach resort. Without doubt one of the top ten hotels in the world. Perched on the rim of the Ngorongoro Crater and with views to die for; people come to Tanzania just to stay here. This is &Beyond’s flag ship property; quirky and something different from other properties on a northern itinerary. 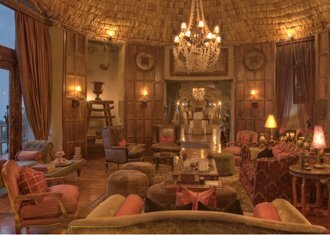 &Beyond call it ‘ Masaai meets Versaille’, we find it verging on over the top - but if you can afford it - you must stay here! An absolute favorite of ours, this newcomer has set a new standard on Zanzibar. The beach here is very, very good and the luxurious and spacious private villas are perfect for families and honeymooners alike. If it can be afforded, it should absolutely be top of your list on Zanzibar.